It’s well acknowledged that first base has always been and probably always will be the most offensively productive position. We expect a lot from our first basemen. Because first base is so deep, many people prefer to fill other roster positions on their squad first with the few players who are above average offensive players elsewhere. Especially if it’s possible to find a first baseman a bit later in the draft with the so-called “upside” to match the production of the first few first basemen taken. Let’s flash back a couple years to the beginning of the 2008 season, when two highly touted first baseman arrived on the scene. We’re talking about Billy Butler of the Kansas City Royals and James Loney of the Los Angeles Dodgers. Both came into the league with an extremely similar offensive profile: Elite batting eyes and questions over power potential. Many people assumed that it was just a matter of time and maturity before Butler and Loney would transform their doubles into home runs. Only Nostradamus knew if we were talking 20-HR potential, 25-HR potential, 30-HR potential, or more for each. Last year, Butler made a solid leap forward, going from 11 HR to 21 HRs. Meanwhile, Loney didn’t go anywhere, reproducing his 13 HR line from the year before. People like to look at trends and assume they will continue. So despite finishing 11 HRs short of Michael Cuddyer, Billy Butler is now viewed as having the upside to improve, whereas the opinion on James Loney is stuck in the mud. 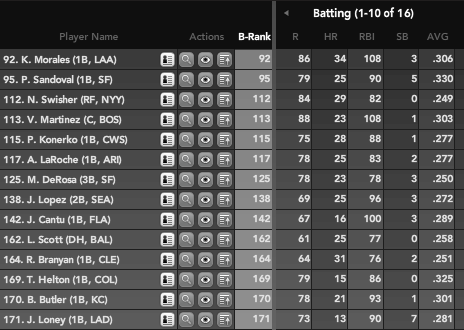 As a result, Butler has zoomed up to about the 6th to 8th round, whereas Loney has slipped down to about the 15th round in a 12-team mixed league. But let’s take another look at last year. 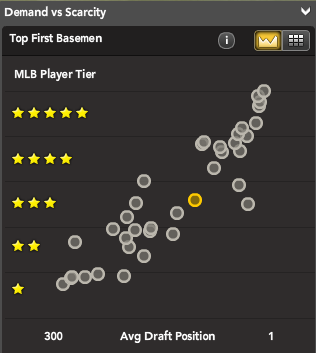 Here’s Bloomberg Sports’ value meter on the 2009 production of first basemen. As you’ll see, Butler hardly separated himself at all from Loney when we take all five offensive categories into account. By this measure, Butler finished as the 170th-best player in baseball in 2009. Loney finished one slot below as the 171st player. Those six extra steals by Loney seem to have erased much of the advantage Butler had over him in the other categories. There’s no doubt that Butler’s 21 HRs showed progress. His power growth is fully supported by a strong batting eye, more fly balls, and a better FB/HR rate. However, for a first baseman, he’ll need to develop even more. The only category he’s thus far demonstrated above-average production compared to his positional peers is batting average. That gives him a pretty high floor as opposed to someone like Chris Davis. But does it give him “upside”? We must again look at his average draft position. According to ESPN’s draft results, he’s going ahead of players like Lance Berkman, Derrek Lee, Carlos Pena, and Cuddyer. To justify this position, given the projections of the other players, Butler will need to hit at least 27 HRs, maintain a .300 batting average, and improve his run production in a woeful Kansas City Royals lineup. These things might happen, of course. But anybody drafting Butler at his current price should realize they are paying full price for that very expectation. In other words, it’s hard to see Butler as a true “sleeper,” no matter what the crowds might think, and it’s hard to figure that Butler has more investment upside than investment risk. He’s a good player. Just not deserving of this draft valuation quite yet. In the meantime, few are figuring James Loney for a power breakout this season, and odds say it’s less than 50% likely it’s going to happen in 2010. However, even if we peg the probability of Loney reaching 20-25 HR at just 25%, given both his current draft position and the fact that he’s coming off a season where he nearly matched Butler in value, he’s the one with the real “upside” here. Hey, like I said, I’m not knocking Butler. I think he’s a good player and I think the power growth was legit. I definitely expect him to hit more HRs than Loney. But what we’re talking about is projected production versus price. Butler may very well be on the verge of breakout, but even if he does, he’ll probably AT MOST live up to his price tag. He’s already being priced at being a nearly 30 HR, .300, 100 RBI player. Those are the kinds of stats you need as a 1B to be drafted in the 6th or 7th round. You can slug more HRs and have a lesser average, but overall, that’s what he’s got to do in 2010. As for Loney, he’s being drafted as a utility guy, one who will hit .295, hit about 15 HR, have good RBIs and runs, and steal a few bases. I’m sure he’s a pretty safe bet to do those things. The question is who has the “upside” to go further: Is Butler a better bet to hit, say, 35 HR, or is Loney a better bet to hit 20+ HR. I think the odds are each are less than 50%. But I think the odds are slightly more in favor of Loney delivering production that surpasses his price tag than Butler delivering production that surpasses his price tag. That’s how I read the numbers and it’s perfectly fair to read them differently. Finally, as to your point about minor-league comparisons. Well, the people who made the comparison may have been wrong at the time, but it was definitely one that was made. Maybe not from the scouts. But in the fantasy community, people were looking at two 1B with good batting eyes who both needed to make gains in power to be productive for fantasy purposes. I think the Loney/Butler comparisons are a little unfair. Not only does Loney lack the minor league resume of Butler, but he’s two years older. 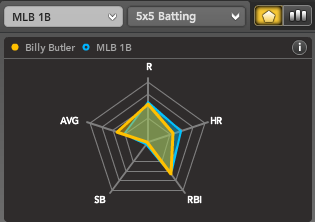 In addition, there is minor league data to support Butler’s power potential. We’ve seen little to indicate the same for Loney. Butler had already displayed his power stroke in the minors — a homer every 21 ABs, two 30-HR seasons, and 13 HRs in 57 games at Triple-A in ’07. Loney, on the other hand, hit a homer every 59.5 ABs in the minors and had never hit more than 11 HRs in any full season. Regarding Butler’s potential in 2010, if you remember, Butler started off last season horribly. He was just 11-for-57 (.193) with zero home runs through his first 19 games. He also had just three homers before June 1. Obviously, we can’t just erase those numbers from his overall line, but if you look at Butler as the 2009 season played out, he significantly improved across the board with each passing month. Granted, less than half a season is a small sample size, but when you’re talking about a former first-rounder who’s put up some of the best minor league numbers we’ve EVER seen, and then factor in what he was able to accomplish in his first full season (as a 23-year-old), is it really that hard to project a breakout? Sure, the team he plays for suppresses run production, but that just makes his 93 RBIs last season even more impressive. It’s hardly wishful thinking to think he can hit 25-30 HRs with over 100 RBIs in 2010. Hard to say the same about Loney and owners can get his half-dozen steals elsewhere. Did I mention Butler hit 51 doubles last year?